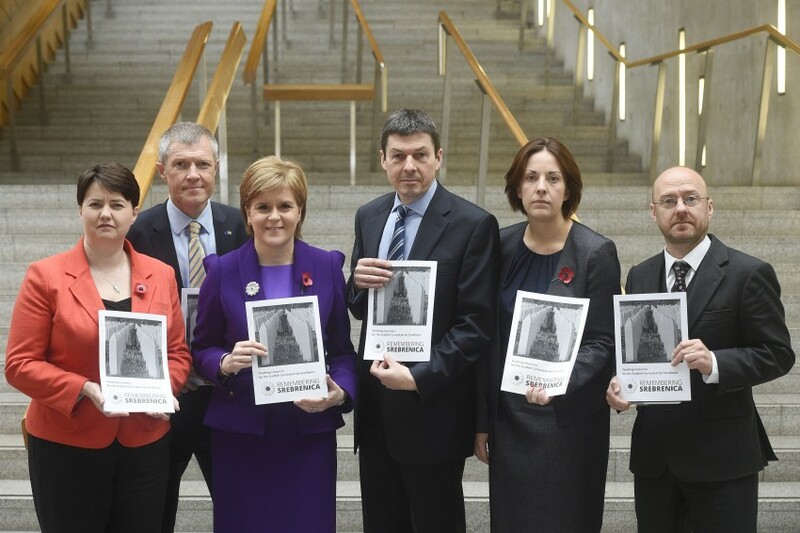 First Minister Nicola Sturgeon today gave her backing to Remembering Srebrenica’s Scottish education pack along with the leaders of four other parties. The First Minister, who in August visited Srebrenica, the scene of the worst atrocity on European soil since World War Two, was joined by Ruth Davidson, leader of the Scottish Conservatives and a director of the Scottish board of the charity Remembering Srebrenica, Kezia Dugdale Leader of Scottish Labour, Willie Rennie Leader of the Scottish Liberal Democrats and Patrick Harvie, Co-Convener of the Scottish Green Party. The education pack tailored by the Scottish Government to the requirements of the Curriculum for Excellence, is a resource designed to promote lessons to be learned from the genocide. These will ensure that students understand the importance of building stronger communities and cherishing differences rather than divisions that can lead to hatred and conflict. “It was an immense privilege to visit Bosnia and Herzegovina in the summer, and meet with survivors and the bereaved of the 1995 genocide at Srebrenica. “I learned first-hand how they have fought to preserve the memory of their loved ones. Their stories are not easy to hear, but they must be heard. “Here in Scotland, we are determined that our young people learn to shape their future through awareness of the lessons from the past – including from events such as the Srebrenica genocide. This education pack is a vital tool in helping our children and young people to understand and learn from the genocide at Srebrenica. “It’s heartening to see the strong cross-party consensus that exists on this issue and I’m proud of my association with Remembering Srebrenica. “All of us should learn this chapter in history which, for many years, was Europe’s “forgotten” genocide. “That’s why this education pack is so important – Srebrenica cannot slip from our collective consciousness and we must never forget the 8,000 men and boys murdered so callously just two decades ago. “Srebrenica is one of the worst atrocities in European history and it is vital that our young people in our schools to know about it. For many people my age it was our first conscious experience of seeing images of genocide on our television screens and those images live with us forever. “With right wing sentiment increasing across Europe, it’s more important than ever to raise awareness of the potential for ethnic tensions to escalate into violence. When 8,000 people can be murdered on European soil only twenty years ago, it is essential that we teach the generations that follow us about the corrosive effect of discrimination and prejudice and how easily it can spiral. 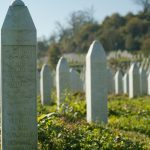 “The word ‘genocide’ often conjures up images of the Second World War, but it’s important we raise awareness of what happened so recently, just 21 years ago, in Srebrenica. Over 30,000 children have already learnt lessons from Srebrenica across the UK thanks to the free resources provided by Remembering Srebrenica. The charity is determined to reach even more pupils right across Scotland with such high level political support and nearly 50 Community Champions having been out to Bosnia-Herzegovina on the ‘Lessons from Srebrenica’ programme. The Scottish board of Remembering Srebrenica is chaired by Very Rev Dr Lorna Hood, former Moderator of the Church of Scotland.